This is our Orc Face. Like most of our pieces, this prosthetic appliance was made to fit most faces. The main picture above is the hot foam latex version applied and painted in green and also features our Evil Monster Brow. This is a big orc face; it has a large rounded nose and a low-sitting mouth. It could pass for a troll or other creatures with different colors and markings. The jaw is large, with a big lip, and it has 2 tusk-like teeth. It is an ideal piece for LARPers wanting to play this classic green character. The brow is a separate piece for anyone wanting a different emotion or style for their orc. It is in two pieces and comes unpainted by default. 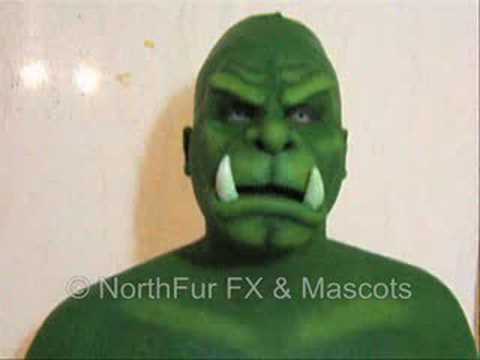 Contact lenses, ears and other prosthetic pieces other than the Orc Face that are shown are not included. Using these types of costume accessories can help accentuate this prosthetic piece's monsterous features.